We were appointed by our developer client as landscape architects for this public realm site adjacent to a proposed shopping centre in central Huntingdon. Once our initial landscape design proposal was approved by our client we were tasked with the preparation of landscape architect ‘s information to discharge Planning Conditions. Our output in this case was a number of detailed planting plans. The area which required the focus of our landscape design input was a pedestrian link. This link connects a proposed vehicular route to the pedestrian shopping district of this historic town. The route is flanked on one side by an existing building and the other a new build wall which was designed to screen the proposed vehicular delivery bay of the proposed shopping centre. Our landscape architects were tasked with the specification of climbing and ground cover plant material. 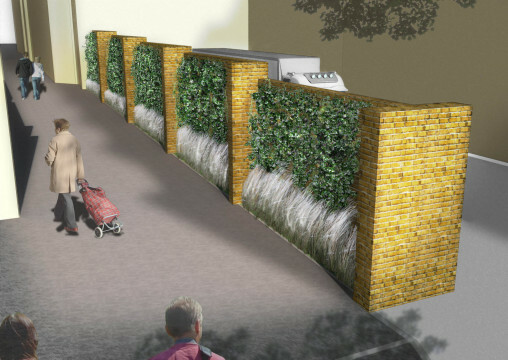 The planting needed be robust enough for this public location, provide all year round interest and help to reduce the visual mass of this screening wall. In addition our landscape architects needed to consider the shading cast by adjacent buildings to the south of the proposed planting. Negotiations were required between our landscape architects and the Local Authorities Landscape Officer to achieve a planting palette which satisfied the requirements of all interested parties. In addition to the pedestrian link planting there were a number of other planting beds which required our input. In these instances the planting needed to be robust and provide evergreen screening to the end elevations of the service entrances of this commercial building. This information was also produce to satisfy the landscape Condition.